If you are looking for a stylish modern floor then why not look at one of our smooth gloss floors. 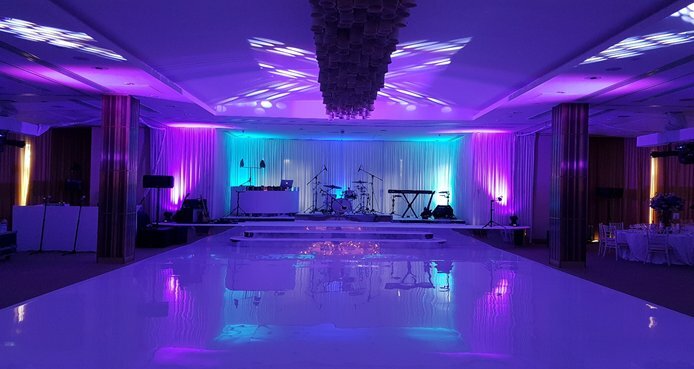 As you can see from the photos these floors really add a stunning look to your event. With the high gloss finish that it gives it works perfectly with your lighting in the room to add the wow factor. 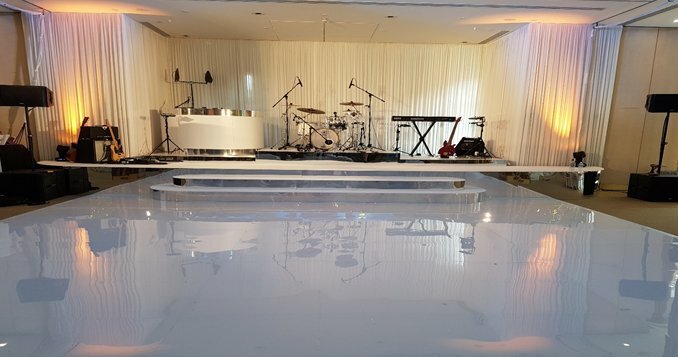 Without the lines that are created by a normal dancefloor panel you get the result of a seamless mirror like finish which will have all your guests impressed. Available in: Black, White, Opal, Yellow, Orange, Red, Blue, Purple, lilac, green and silver / grey. If the gloss finish is not the effect you are looking for we can also provide all of the colours in a Matt finish. This can be supplied in any size of floor in two foot measurements. This finish also allows you to have graphics stuck to the floor without the traditional floor lines breaking up the pattern. As you can see from the photos this flooring really stands out in the room working fantastically with the lighting scheme.